Welcome to TheologyDegreesOnline.com. Our site was created to help students find and research online theology degree programs. 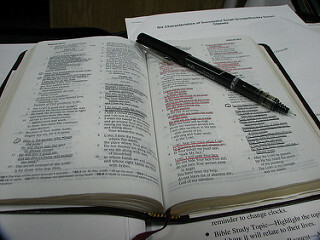 Theology is a broad field of study, and degree programs vary. To learn more, we have listed commonly asked questions below to help you find the information you need. 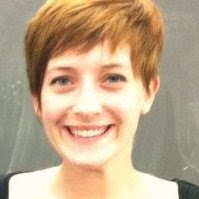 You can also learn more by visiting our blog, authored by Erin Koster, a third-year seminarian. What schools offer theology programs and how do I learn more about them? What are the different types of theology degrees? What can I do with a degree in theology or religious studies? Online degree programs in theology vary widely and not every school offers the same courses and program structure. The type of degree you decide to pursue will determine the coursework and length of time it takes to complete the program. Online programs require students to complete the same courses as traditional, on-campus programs. Theology degrees are available at the associate’s, bachelor’s, master’s, and doctoral levels. For those seeking a graduate degree in theology, there are several options, such as a Master of Arts in Theological Studies, Master of Arts in Biblical Studies, or a Master of Divinity. A doctoral program is professional training for academic work and prepares graduates to become professors or researchers. Associate’s Degrees in Religion An associate’s degree in religion commonly takes two years to complete and provides a foundation in theology, the Bible, and other holy books. This degree is ideal for pastors looking to grow in their knowledge and to earn further qualifications. Associate’s Degrees in Ministry An associate’s degree in ministry commonly takes two years to complete and increase one’s ability to lead services, be they secular, religious, professional, or personal. 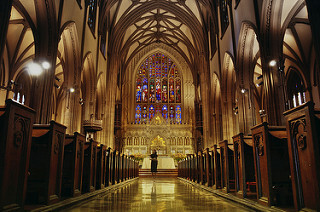 Bachelor’s Degrees in Religion A bachelor degree program in religion focuses on the history, tradition and cultural importance of religion in the world. This degree develops general academic understanding and critical-thinking skills in the context of religious studies. Bachelor’s Degrees in Christian and Bible Studies A bachelor’s degree in Christian and Bible Studies are normally four-year degrees that prepare graduates to excel in worship, education, research, and counseling careers. Bachelor’s Degrees in Ministry and Leadership A bachelor’s degree in ministry and leadership is designed to prepare students for effective church ministry, provide hands-on experiences in a church setting, develop practical skills, and improve knowledge of Christian leadership. Master’s Degrees in Religion and Divinity A master’s degree in religion and divinity is a graduate degree and the most common degree granted by seminaries and divinity schools. Coursework usually involves study in New Testament Greek, theology, philosophy, church history, pastoral theology, Hebrew Bible, and the New Testament. Master’s Degrees in Christian and Bible Studies A master’s degree in Christian and Bible Studies is a program that promotes understanding, interpretation, and application of biblical literature. This program prepares students to work in the fields of ministries of teachers, missionaries, church leaders, and other ministering personnel. Master’s Degrees in Ministry and Leadership A master’s degree in ministry and leadership are designed for those that possess a bachelor’s in religion and seek a leadership role in their church or synagogue, or for those without a religious background that are passionate about exploring a new field. Master’s Degrees in Christian Counseling A master’s degree in Christian counseling is designed for those who are passionate about incorporating religion into traditional counseling. Curricula in these programs start by introducing students to basic tenants of psychology. Master’s Degrees in Theology A master’s degree in theology often takes two years of specialized advanced study in theological research. Students frequently combine a major in theology with another major to amplify their skills in service-oriented professions. There are as many theology degree programs available as there are ways to pay for them. Check out our financial aid guide to see how you can secure your future in theology today! Where can a degree in religion or religious studies take you? Your options are surprisingly diverse. By earning a degree in theology or similar discipline, you’ll be qualified for a range of endeavors and ministry-related careers. To learn more about your career options, you can visit The Bureau of Labor Statistics for job descriptions and salary statistics. In the meantime, let’s take a look at some of your career options in this field. Clergy Conducts religious worship and performs other spiritual functions associated with beliefs and practices of religious faith or denomination as well as provides spiritual and moral guidance and assistance to members. Religious Directors and Leaders Plans, direct, or coordinates programs designed to promote the religious education or activities of a denominational group. May provide counseling and guidance relative to marital, health, financial, and religious problems. Philosophy and Religion Teachers Teaches courses in philosophy, religion, and theology and includes both teachers primarily engaged in teaching and those who do a combination of teaching and research. Camp Counselors Designs and leads leisure activities for groups in volunteer agencies or recreation facilities, such as playgrounds, parks, camps, aquatic centers, and senior centers. Social and Community Service Managers Coordinates and supervises social service programs and community organizations as well as directs and leads staff who provide social services to the public. 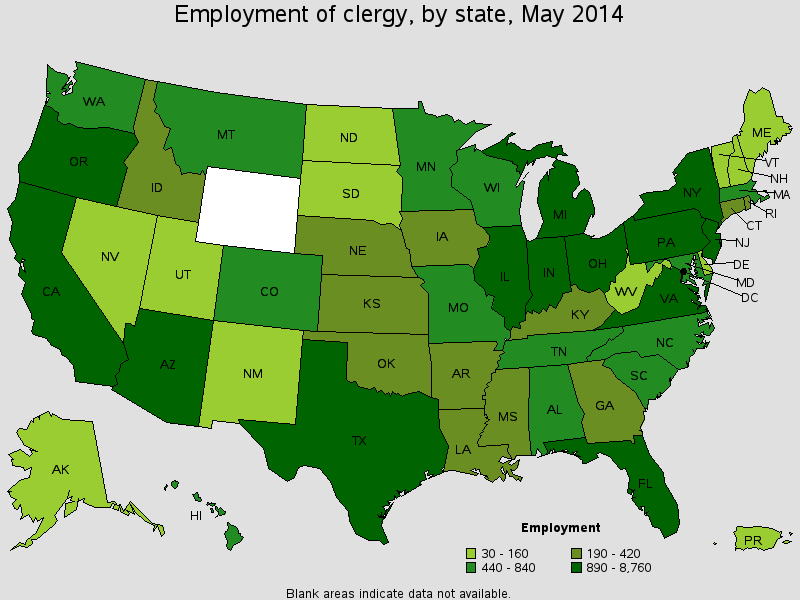 The Bureau of Labor Statistics provides a useful map of the areas with the highest published employment, location quotients, and wages for clergy in the United States. It’s helpful to get a sense of the job market and employment outlook in your chosen field.